Though screens seem like simple, unimportant parts of our daily modern lives, the role they play to protect us and help us better enjoy our lives is undeniable. Screens became incredibly popular during the Civil War to protect ailing soldiers and others from insect pests. Eventually the concept caught on throughout the South and beyond and screen doors came into being. Screens effectively helped to eradicate many diseases that were transferred through insects by 1950, improving not only the health of U.S. citizen, but also their quality of life. Those of us at Metro Screenworks believe in providing high-quality, custom screen doors and other screen products that can do just as modern screens predecessors did: protect and provide a better quality of life. Through advances in technology, Metro Screenworks is able to provide homeowners, contractors, and business owners screen doors that can meet your basic needs and give you sun protection, ultimate durability, and more. So, why choose us above other popular home improvement stores, local mom-and-pop shops, and warehouses? Metro Screenworks is the Top Rated National® Screen Store and have been since 1979 due to not only our superior selection of products, but also the superior quality of those products. If you buy a product from us, it will do exactly what we claim it will do. Our Englewood, Colorado-based business offers our custom hinged and sliding screen doors and screen door repair parts not just to the surrounding area, but to the world. Keep reading below to learn more about our screen doors and why you should choose our custom screen doors. Read customer reviews here. Metro Screenworks offers you options so that you can have a door that not only fits your home or business, but also provides all that you need it to do. We offer a variety of screen door options including sliding screen doors, hinged screen doors, retractable screen doors, French door screens, and more. If you’d rather change the screen in your current screen door, we offer economic rolls of our all our screening materials in various lengths and widths. Our customers choose us because they know that they will receive high-quality affordable screen door products every time. Every product is made in the U.S.A. and constructed for the wear and tear that screen doors endure daily. When you order from Metro Screenworks, you can rest assured that you will receive quality that you can count on. Want to see what our product is like before you order it? Request a sample! Metro Screenworks is the online screen store that you can trust. We offer quantity discounts and sell to homeowners, contractors, and anyone who needs high quality screens. Contact us to learn more about our quantity discounts or ask us a question. Check out our FAQ page, too! Because we sell custom screen doors, we give our customers options. Not only do we give you color, size, and screening material options, but we also give you multiple screen door options unavailable anywhere else such as French door screens. We also offer a variety of price points and even wholesale options. Keep reading below to learn more about the custom screen door options that we provide. We offer several types of screen doors for we realize that for the homeowner wanting to upgrade their sliding screen door they will probably be looking for something that is better than what they currently have, but for the wholesaler, they are looking for the best quality at the best price. Here are some of the sliding screen door types we offer. Cast metal, color-matched adjustable height handles. Our retractable screen doors are easy to handle and can withstand the wear-and-tear of everyday use. Contact us if you wish to order wholesale. Metro Screenworks only sells the highest quality and affordable screen doors and screen door brands such as Genius. Genius provides for those needing the ultimate custom screen door solution. Genius retractable screen doors have been proven to withstand the test of time and last longer than many other screen door brands. While giving you longevity, these screen doors also give you the comfort and convenience that you deserve. In addition to offering custom- made single retractable doors, they also offer a French retractable screen door option as well! Along with offering sliding and retractable screen doors, Metro Screenworks also offers high-quality hinged screen doors. Our hinged screen doors are made of high-quality materials and are American made. All are custom-sized to your specifications, available in several options including ones with deadbolt and stainless steel security mesh. Security screens give you—as you may have guessed from the name—security, while still allowing you to enjoy some fresh air. 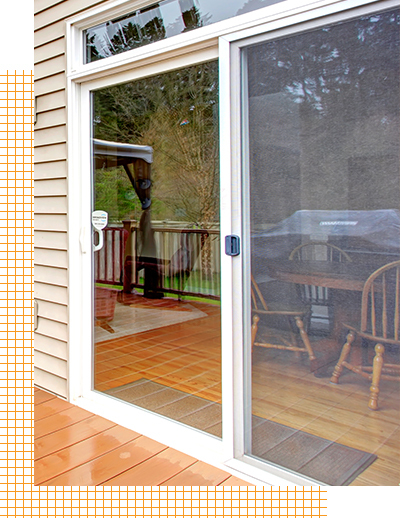 Click below to learn more about our hinged screen doors and order yours today. Metro Screenworks is the online screen store that truly gives you options. We offer a wide variety of screening material to homeowners, contractors, and business owners. You can not only get these specialty types of screen pre-installed in most of our custom screen doors, but you can also order rolls of screening material to install the screen in your existing screen door. Continue reading below to learn more about our specialty screen products. Super screen is one of the most durable screen materials on the market that you can truly count on to endure the elements. Super screen is made from vinyl-coated polyester that is both pet and hail resistant. Tired of repairing your screen door? Super screen can be solution to repeated repairs. Pet screen is similar to super screen in that it is also made from vinyl-coated polyester and can withstand some of the toughest treatment. If you are tired of having ripped, ineffective screens or always having to replace your screen, pet screen is the solution. Install it in your screen door and screened in porch. We have a pet screen door as well! Pet screen comes with a 10-year warranty, ensuring that the pet screen will endure. We often get questions as to which to choose, because they seem to offer similar benefits. Super screen’s mesh strands are thinner than pet screen and so super screen offers durability, but more visibility than pet screen. Pet screen, on the other hand, gives you ultimate durability. Keep in mind that super screen is manufactured up to 120 inches in width and pet screen is made up to 96 inches in width. 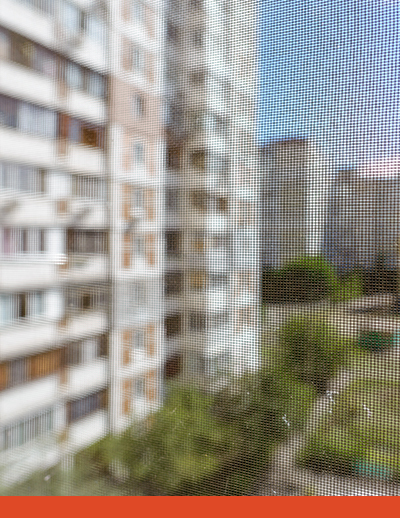 Do you have a beautiful view out your back door, but the screen always seems to ruin it? Nevermore! Bettervue is a light fiberglass invisible screen that makes it easier to enjoy the view while also improving natural light and airflow and reduced glare. Install BetterVue in your screen door and start enjoying your view. Our Brite Bronze screen is a copper screen made up of 90 percent copper and 10 percent zinc that, as it ages, turns a beautiful bronze color. Copper Mesh works for anyone wanting an elegant look, but is favored by those wishing to accent wood screen doors or keep the character of their renovated home. The sun doesn’t just cause damage to human skin. The UV rays of the sun are powerful and can cause fading, discoloration, and cracking on hardwood floors, upholstered furniture, decor, and other interior fixtures. Solar screen can block from 65 up to 90 percent of UV rays, providing protection for your home’s interior and giving your home energy-efficiency. The most annoying pests are those that you can hardly see, but can feel buzzing around your face. 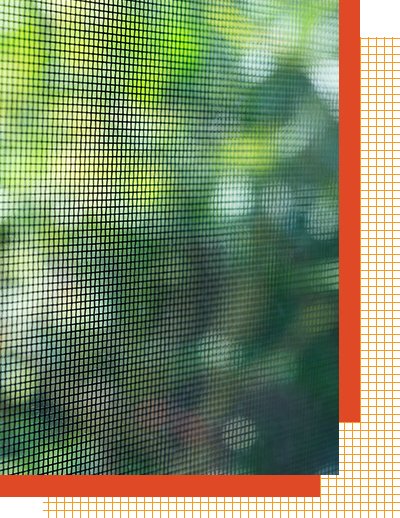 Gnats and other small insects called no-see-ums can sometimes make it through the mesh of regular screening. However, tiny mesh, as the name implies has smaller holes thus blocking small pests from making their way into your home. Stainless steel screen offers more strength and visibility than traditional fiberglass or aluminum mesh and is resistant to rust. SeeVue Stainless Steel screen is a perfect addition to screen doors and porch panels made with pressure-treated wood and is an excellent choice when you are looking for a mesh that will withstand daily wear and tear and weather extremes. Want to install your own screen door or just need to make a repair? Metro Screenworks offers high-quality replacement sliding screen door parts, screening tools, sliding screen door track, rolls of mesh and more. If you want to repair or assemble your own screen door, we have everything you need to get the job done right. Click below to view our inventory. Want to assemble your own screen door? Watch this video for guidance. Have a question about our products? Want to know more about measuring for installing a screen door? Read our FAQ page to learn more about us, our products, and more. If you still need to know more or your question isn’t answered, feel free to contact us! Metro Screenworks offers high-quality and affordable custom screen doors that are not only high-functional, but also contribute to the overall aesthetic of your home or business. In addition to screen doors, we offer many more screen products including window screens, retractable solar screens, screened-in porch panels, and more! Shop our full inventory online! Want to learn more about installing screen doors, the types available, and when to use them, and other related topics? 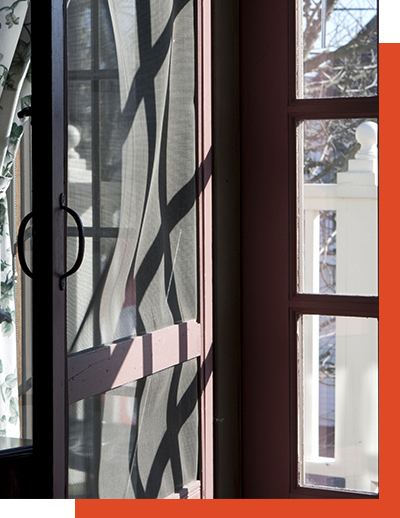 Read our recent blog posts about screen doors, screen door repair parts, and more.